Eritrea is rebuilding its global reputation – but what does this mean for human rights at home? Eritrea has been, rather unaffectionately, labelled as Africa’s North Korea by a large section of the Western media in recent years. The secretive state was the single largest source of refugees arriving in Europe between 2014 and 2016 – which says a lot for a country with a population of 5.2 million. It’s fair to say the country’s human rights record is abysmal and the government’s policy of forced, indefinite military conscription compels thousands to flee Eritrea every month. However, things are changing in the Horn of Africa with a historic peace deal being signed between Eritrea and its bitter rival Ethiopia, improved relations between Eritrea and Somalia and even signs of progress with Djibouti. Now, Ethiopia and Somalia are joining Eritrea in calling on the UN to lift sanctions against “Africa’s North Korea”, with Djibouti being the notable exception that didn’t make its own request. Either way, Eritrea is rebuilding its reputation on the global stage through a new era of cooperation with its regional neighbours. This marks a stark contrast to the secretive state that closed its doors to the world almost three decades ago – but what does this mean for the country’s human rights record going forward? Since gaining independence from Ethiopia in 1993, following a brutal 30-year-long civil war that killed more than 100,000 civilians, Eritrea quickly turned from a symbol of hope for its people into a brutal dictatorship. The newly independent nation was supposed to start a new era for African politics. A young president Isaias Afwerki publicly criticised African leaders for holding on to power for too long, rejected the notion of creating a cult personality (akin to Ethiopia’s Mengistu Hailemariam) and was referred to by then-US President Bill Clinton as a “renaissance African leader”. Eritrea enjoyed a few years as being the focal point of economic potential in the Horn of Africa. This potential was never realised, though, and Eritrea failed to (or chose not to) become a regional player with its neighbours and their Western allies. At the same time, the constitution Afwerki’s government created was never implemented and Eritrea has remained a one-party state ever since. The young, charismatic leader shed his reputation as a “renaissance African leader” and become a dictator of equal measures to the worst African leaders he criticised for holding on to power for too long. Why Afwerki shut the door on all of the progress he fought so hard to secure remains a mystery. Some analysts suggest he’s a deeply flawed character who fell victim to his own narcissism and paranoia. A more niche theory is that he wanted to develop Eritrea without the interference of Western powers who supported Ethiopia’s occupation throughout the brutal 30-year war. Either way, for the Eritreans who survived this conflict, the result was the same. The war with Ethiopia never really ended but a new period of oppression under Afwerki began and the country’s former hero became its overlord. However, things are different now – at least, in theory. Eritrea and Ethiopia signed a peace deal in July, bringing an end to the “state of war” that has existed between the two neighbours long after they parted ways. This has paved the way for improved bilateral ties with Somalia and speculative efforts to improve relations with Djibouti. Now, Eritrea is a genuine player in the Horn of Africa region and its new cooperative stance proves how important it is for peace and economic prosperity in the region. 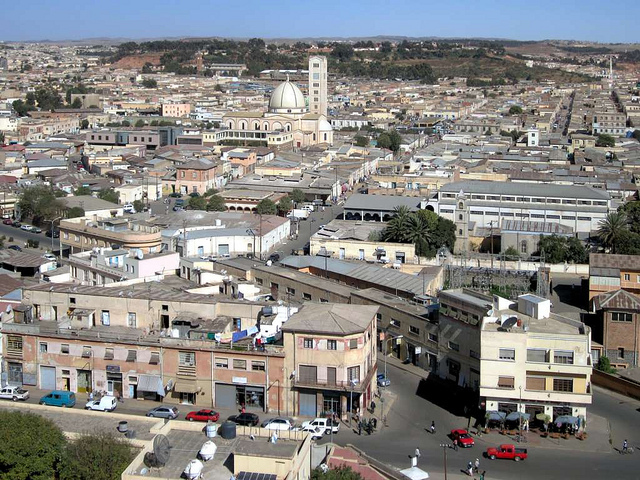 Eritrea has opened its doors to the region and, perhaps, the wider world. What now for human rights in Eritrea? Unfortunately for Eritreans, the country rebranding itself as a cooperative partner on the international stage doesn’t mean an open democracy and transformation regarding human rights is coming. Of course, the international community is going to push for Eritrea to clean up its human rights record but there’s a limit to how much of an impact this can have. Let’s be honest about this: Ethiopia and Rwanda have had no problems with maintaining authoritarian regimes while dealing with the UN or global financial partners. It seems Eritreans aren’t too confident about their chances of seeing a better quality of life anytime soon either. Roughly 15,000 Eritrean refugees have arrived in Ethiopia since borders between the two countries opened, as part of the recent peace deal. There is at least one reason for Eritreans to be optimistic, following the recent peace deal with Ethiopia. Eritrea has said it will cut the size of its army now that the conflict has ended, as part of changes to its system of mandatory national service. It’s a rather vague statement that doesn’t go as far to suggest people will no longer be forced to serve their country indefinitely but improvements to this system could help curb the exodus of Eritreans fleeing Afwerki’s regime. Reforming the military won’t prevent the arbitrary arrests, political suppression, religious persecution and other human rights violations believed to be taking place in Eritrea, though. Sure, the UN and other western influencers will be pushing for improvements in these areas, too, but their effectiveness is limited and their motivation is generally economic rather than ethical. If Eritrea can become profitable, human rights records will fall from the top of priority lists. In fact, this may already have begun with calls for sanctions against the country to be dropped coming from its regional allies (following economic partnerships). In fact, Eritrea stepping up to the international stage with regional support only reinforces Afwerki’s position as the country’s leader – something that could halt progress on human rights more than it facilitates it.